The Sellwood Economy Range offers functional attic stairs at very affordable prices. 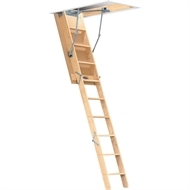 The Sellwood J24 Junior attic stair is suitable for any stud height between 2200 - 2440mm with an opening size of 1135 x 560mm. The J24 is equipped with many of the same features as the Sellwood Regular range, offering excellent durability at a great price.